A flexible furniture configuration allows the EPI Center to be transformed from a lecture-style configuration to small pods of tables. In 2012, the New Trier Township High School, in Winnetka, IL, set out to overhaul the EPI Center, a collaborative meeting space on the third floor of its Winnetka Campus. The mixed-use meeting space had been used previously as a central location where students, staff, administration, and the public could gather and work. Tom Garrity, AV and multimedia manager at New Trier, brought in AVI Systems as the technology integrator for the EPI Center project. Thomas Burns, system sales specialist for AVI Systems and an alum of New Trier Township High School, reported that initial plans, based on consultations with teachers and faculty, ran the gamut, from projection systems to video walls. To please a client that Burns reported was “very keen on detail” and looking for a minimum of exposed hardware, AVI Systems ultimately selected and installed a six-foot-wide by three-foot-high bezelfree video wall with 42-inch plasma displays from Salitek. The wall’s Multi Plasma Display Panels (MPDP) offer a small mullion, at only 0.9mm on each side. In a recent class, a teacher presented a foreign language movie on one half of the video wall and students used their iPads to participate in discussion that was displayed on the other half of the wall, answering questions posed by the teacher and their peers. All input signals are managed by a Crestron DigitalMedia router and control system, which allows users to control the room locally from a 15-inch V-touch panel, as well as through web remote. Audio is processed with a Biamp digital signal processor for ceiling and podium mics, and Shure ULX-D wireless with reinforcement by K-Array amplifiers and speakers. Additional technology elements include motorized MechoShades and Lutron light dimming. According to Burns, the school had already relied on Apple for its mobile tablet applications. The Salitek video wall supports the ability to display up to six images at a time in different image layouts. 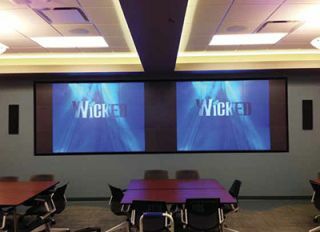 The video wall is capable of displaying from a number of additional sources, including laptop connections from the podium, Blu-ray DVD, document camera, dedicated Mac Mini, Polycom HD videoconferencing, and web-based conferencing such as Skype, GotoMeeting, and FaceTime using two Vaddio HD room cameras. “The web-based conferencing component was very important, as it is something they use often. We’re using the Vaddio AV Bridge, which allows the room sources and cameras to be streamed on a web-based conference via USB. The sky is the limit as far as web-based conferencing there,” Burns added. The EPI Center meeting space is highlighted by a custom radius lectern featuring a customized brass school logo and manufactured by Marshall Furniture. A flexible furniture configuration allows the room to be transformed from a lecture-style configuration to small pods of tables. The flexible nature of the furniture allows for multiple transitions during a class or meeting. The new EPI Center, which was partially funded by a major donation from the New Trier Education Foundation, is a continuation of the Innovative Classroom program started three years ago with the remodel of several classrooms on both the Winnetka and Northfield, IL school campuses. According to the school, experiences that teachers will have in the EPI Center and continue to have in the Innovative Classrooms will help inform decisions about future Winnetka Campus facility upgrades. Derek Dellinger is the online editor of SCN and Residential Systems.